Exiled Chief Abbot of the Kirti monastery, which has stood at the centre of the 11 self-immolations since March, has firmly blamed these self-immolations as a result of Beijing’s repressive policies, and that they would continue if left unabated. Kyabje Kirti Rinpoche, 70, said Beijing had responded to the immolations with tougher repression of Tibetan monks. But he said the authorities could put an end to the protests "overnight" if they changed their approach. The abbot, who lives in India, is spiritual leader of Kirti monastery. It has thousands of followers in Aba prefecture in Sichuan in western China. Kirti Rinpoche fled into exile in 1959, but said he had received information about the situation at the monastery through underground channels. "Chinese government policies are the cause of the immolations," he said at a news conference in New York organised by the campaign group Human Rights in China. Specifically he blamed "the drastic nature of the repression that the Chinese government has been waging all over Tibet", saying "the level of repression is similar to all of Tibet being under virtual martial law". The wave of immolations has been unprecedented - Tibetan Buddhists have not protested in this way in the past. But since March , 11 Tibetans have set fire to themselves, at least six have died, the fate of the other five, who were all taken away by Chinese authorities, is unknown. The first immolation at Kirti was by a 20-year-old monk, Phuntsog. China responded to that immolation, Kirti Rinpoche said, by stepping up its repression. Three-hundred monks were taken away, he said, and what has happened to them is not clear. Hundreds of government officials were also brought in to the monastery, he claimed. They had divided the remaining monks into 55 small groups to be re-educated, and installed surveillance cameras in the monastery. 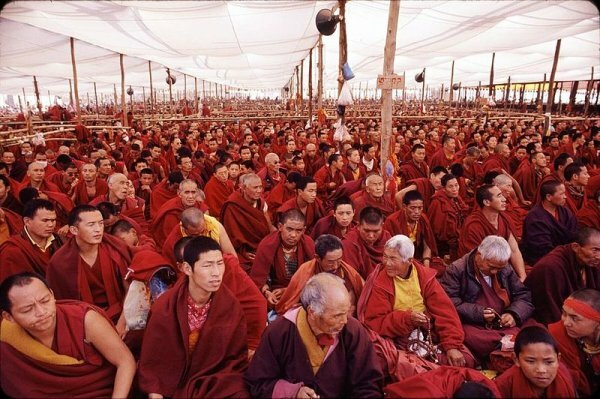 The monks, Kirti Rinpoche said, had had a "patriotic re-education campaign imposed on them almost round the clock, random searches of monks' quarters, these are the reasons that have been driving the repression to a point where the Tibetans find it unbearable". The abbot described it as "nothing short of imprisonment", saying: "Tibetans have really reached their breaking point." "At this point every monk in Kirti monastery has been living in a state of terror." Foreign reporters have been banned from Tibetan areas this year so it has not been possible for outside observers to travel to the region themselves. China's government has claimed that Tibet's exiled spiritual leader, the Dalai Lama, instigated the immolations, describing them as a form of terrorism, and contrary to Tibetan Buddhist traditions. It has criticised the Dalai Lama for not condemning the immolations. But Kirti's abbot said Tibetan people make their own choices. "We do not have the moral authority to tell them what to do or not to do. The monks have been pushed to this great desperation and they are finding they can only express their resistance to Chinese rule by setting themselves on fire," he said. "By removing the troops, and stopping the re-education sessions and changing its hardline policies, the Chinese government can put an end to the self-immolations overnight." "So long as the cause is there, the result will continue to unfold."